I am a British author and journalist. I grew up in London in the 1970s and studied at Leeds University, where I also edited the student newspaper. I enjoyed a peripatetic career on a number of Fleet Street newspapers with assignments that ranged from seeking London's best dry Martini to investigating Nazi war criminals who found sanctuary in Britain. In 1991 I decided to become a foreign correspondent and moved to Budapest to cover the aftermath of the collapse of Communism. I also spent much time in the former Yugoslavia, covering the wars in Croatia and Bosnia. 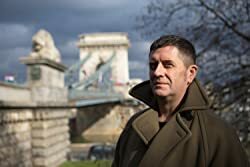 I moved to Paris for a year in 1997 to write a thriller, which eventually became The Budapest Protocol, then returned to Budapest. Over the years I have worked in more than 30 countries and enjoyed some hair raising adventures along the way. I now write for the Economist, The Times (of London), Monocle, Traveler and many others and I review books for the New York Times and the Financial Times. I also teach journalism at Mathias Corvinus Collegium in Budapest. I've written eight non-fiction books and two novels, which have been published in twelve languages including Chinese, Japanese, Hebrew and Hungarian. These include the ground-breaking Hitler's Secret Bankers, which exposed Swiss economic complicity with Nazi Germany and which was shortlisted for the Orwell Prize; a biography of Slobodan Milosevic, now regarded as the standard work on his life and City of Oranges, which recounts the lives of Arab and Jewish families in Jaffa, and which was shortlisted for the Jewish Quarterly Prize. Please enter your email address and click the Follow button to follow Adam LeBor!